If you read my first post then 1.) THANK YOU! and 2.) That post was partially inspired by my best friend aka BFF. You see we love to cook together. Well, actually it’s more like she likes to be in the general area of where I’m cooking and then eat the meals I prepare. If you’re reading this BFF, sorry, but you know it’s true! My poor BFF, she really does try, but life just seems to always get in the way of her culinary journey. She’s constantly telling me she’s always missing an ingredient and never knows what to add to her foods. So, I gave her a list of different spices, sauces, and various basics to keep on hand, to add flavor to her dishes. I remember her resistance to one particular item on my list, and I quote, “Red wine vinegar? What am I suppose to do with that?” Oh, ye of little faith, you can incorporate vinegar into many dishes. Just try it! In fact, I was impressed, she used all of the spices I listed and had basics like onions, garlic, and potatoes stocked. 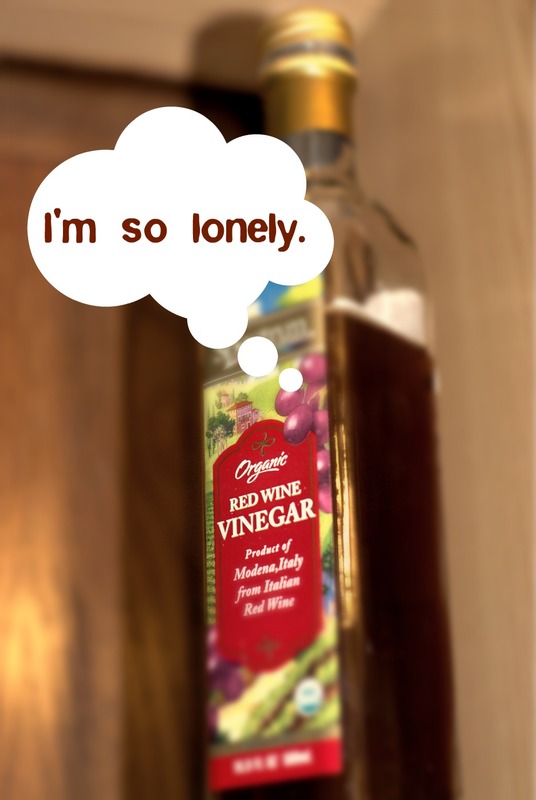 However, over time, that bottle of red wine vinegar seemed to be growing roots in her cupboard. Even though it’s been over a year, I think that bottle is still sitting on her shelf! Don’t worry little bottle of vinegar, you haven’t expired, you’ve still got time. In fact, I’m dedicating this post to you, and hopefully my BFF will get the hint and finally use you. Why does it take between 1 hour -1 hour and 15 minutes to prepare this dish? If I could give you any advice it’s always best to read the entire recipe, before you do anything. It’s one of the most important things you can do to prepare a dish. Trust me, it will save you time in the long run. However, I don’t always follow my own advice, and if you didn’t read the entire recipe for this dish and only made sure you had all of the ingredients. Make sure you add 15 minutes to the cook time. For the chicken breast I prefer bone-in, tons of flavor and they are cheaper at the grocery store! I hate when recipes give you exact amounts, outside of baking, it should always be to taste. Some like a little more or a little less. However, less is sometimes more so be careful, and remember you can always add salt and pepper at the table. If you do not have vegetable oil then olive oil will work too. If you only have regular butter that’s ok, just go lighter on the salt. Substitute 4 dry leaves, if you do not have fresh leaves, and if you do not have either, add more thyme to the recipe. My Mamaw always said there’s nothing wrong with a little extra suga (sugar), so if it is too bitter for your liking then add a little more, you can always even it out with a bit more red wine. Preheat the oven to 350˚F and make sure the oven rack is positioned in the middle slot. After rinsing the chicken off in cold water, dry, and coat with 1-2 tablespoons of oil, then sprinkle with salt and pepper. Heat oil and 1-2 tablespoons of butter, into a large skillet over medium to high heat and brown the chicken. It will usually take about 10 minutes to brown each side, (done in two batches). Transfer chicken to a roasting pan, and roast uncovered in the oven for about 15-20 minutes. While the chicken is roasting, start making the sauce. Leave the fat/liquid from the chicken in the skillet and add the garlic, carrots, shallots, thyme sprigs, and bay leaves and cook over medium heat. Stir frequently and scrape pan if necessary. When the vegetables are translucent/brown, add tomato paste and stir for about a minute. Add wine, vinegar and sugar. Again if it is too tart for your liking then add a little more sugar. Add salt and pepper to taste, and bring to a boil. The sauce should reduce to half, which takes between 5-10 minutes. Add the chicken broth to sauce and any juices from the roasting pan and boil. Pour sauce through a mesh strainer and pour liquid over chicken (still in the roasting pan). Try to get as much liquid out of the solids as possible, and discard. Roast the chicken uncovered until cooked through, for another 15-20 minutes. 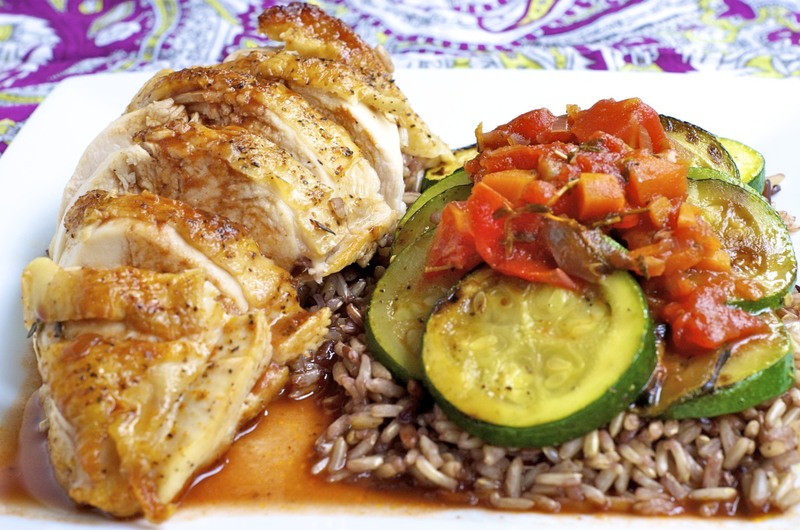 Once the chicken is cooked thoroughly, remove sauce from the roasting pan and place chicken in an oven proof serving dish. Then place the chicken into the now turned off oven. While the chicken is keeping warm in the oven, boil the sauce you removed from the pan, over high heat until reduced to about 1-2 cups. Stir in 2 tablespoons of butter and pour sauce over chicken. Season to taste with salt and pepper. This dish goes great with rice, or sautéed vegetable (as shown in the picture), but the true star of this show is the wine sauce, which I love because it is sweet and tangy. It’s so easy to make and you can definitely wow a crowd with this one. Enjoy! ← Why One Big Mix? Congratulations on your launch! Love the graphics, and the lonely little vinegar bottle! The recipe looks delicious and one that I will have to try! Would love to know your recipe for the sauteed veges. They look good too! Great post and congrats! You have a talent for cooking. So excited for you! By the way…whats your Twitter handle? Great job with the recipe and humor! Love it!!! Thanks! Yes, please let me know how you like it! And what do you think I wanted to do when I saw those cinnamon rolls?? haha…. thanks for stopping by. I’m already loving your blog, keep up the great cooking! Thank you! I was actually a vegetarian once, but only for 4 months. Don’t worry I’ll be posting some of my favorite vegetarian dishes soon, stay tuned.